After eating at the Cheesecake Factory and having the Madeira Chicken, I had to find the recipe and try making it at home. Here is the recipe and it is just as delicious as it was at the Cheesecake Factory!! Thanks to RLSafford for sharing this recipe. You can get more copycat restaurant recipes just like The Cheesecake Factory recipes here at Copykat.com. 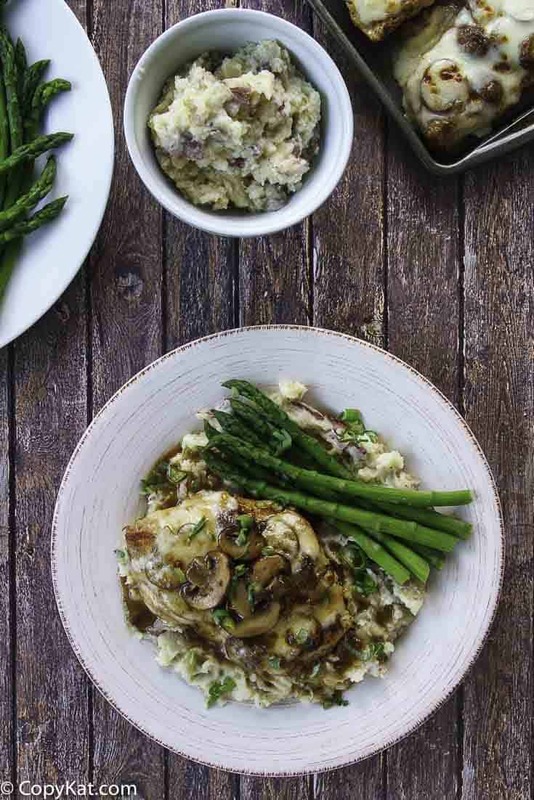 Cheesecake Factory Chicken Madeira tastes even better when you make it at home. careful not to overcrowd the pan. You may need to cook the chicken in batches. When the chicken's edges turn white, flip over, and cook chicken on the other side. The chicken should be slightly browned. Remove chicken from the pan. Add 1 tablespoon of butter to the pan, and add mushrooms. Cook the mushrooms for a couple of minutes. The mushrooms will begin to brown and sear. Remove mushrooms from the pan. Add 2 cups of Madeira wine in the pan, scrape the browned bits up from the bottom of the skillet. Add beef broth to the wine, stir to blend well. Cook the sauce until it reduces by 1/3. When the sauce has reduced add a slurry of 1 tablespoon cornstarch and 1 tablespoon water. Stir to blend well cook for about 2 minutes. Add two tablespoons of butter to the sauce and stir well. Return mushrooms to the sauce. To serve: place chicken breast on a pile of mashed potatoes. Spoon sauce over the chicken, and add a slice or two of the Mozzarella cheese on top of the chicken. Place the chicken under the broiler until the cheese browns if desired. You can place the chicken with cheese in a hot oven to warm the cheese. Garnish with Asparagus spears. I noticed there are 4 different types of Madeira wine. Which one do I use for Madeira Chicken? Also, is there a specific brand that is the best to use, or not? I would use a drier Madeira wine, I don’t have any suggestions on brand. If I am unfamiliar with the brand, I typically buy the mid priced one. i worked for cheese cake. we used ALLOT more butter. think of….you know those tea light candles? that much. two of those. I would cook your chicken off ahead of time. and your asparagus. Have it all ready to go. Do your chicken in the pan, save the junk at the bottom (the fond, the brown scraps and juices- thats all your flavor! ), then hit it with your wine while your pan is still hot- this will deglaze your pan, then add your stock, let it reduce until you have a thick sauce, enough to coat a spoon, throw in your veggies (which you wisely pre-cooked) , then add a ton of butter. then throw the chicken back in there for a few min- serve. Since this is one of my favorite things to order at The Cheesecake Factory, I just had to try it out! Somehow I got the chicken under-seasoned, and the sauce too salty. I didn’t add salt to the sauce, so perhaps it was the Madeira I used. Next time I’ll have to try a different kind. I should tell you my story about making chicken marsala. I didn’t realize there were multiple kinds of marsala, so one evening, I had a very special date. I picked up the sweet marsala. Bad move, really bad move. I had a huge plateful of overly sweet chicken marsala. Honestly it was gross. It was the first night I had cooked him dinner, and the poor guy made some of the oddest faces. Put that on top of that I run a recipe website, ouch. That’s all I am saying. You could always add a little bit of butter to the sauce while it is reducing to help the sauce thicken. Sometimes wine sauces can be a little tricky. Thanks for the tip. Made the recipe as stated and it came out great but took a loooong time to reduce the sauce. I think in the future i’ll start the reduction in in a small pot while the chicken is going so that it’s halfway done when I deglaze.